How exactly does Messi do it? In this article, we’ll show you 7 drills you can use to instantly improve your dribbling and ball control in soccer. We’ll look at technique, dribbling decision-making, and methods you can use to maximize your agility. What’s the secret to dribbling? As you’re probably aware if you’ve ever played soccer, dribbling isn’t exactly a walk in the park, especially in-game. How do the pros make it look so easy? You can’t just watch the ball when dribbling. The best of the best have an awareness of exactly what every player in their vicinity is doing at all times. 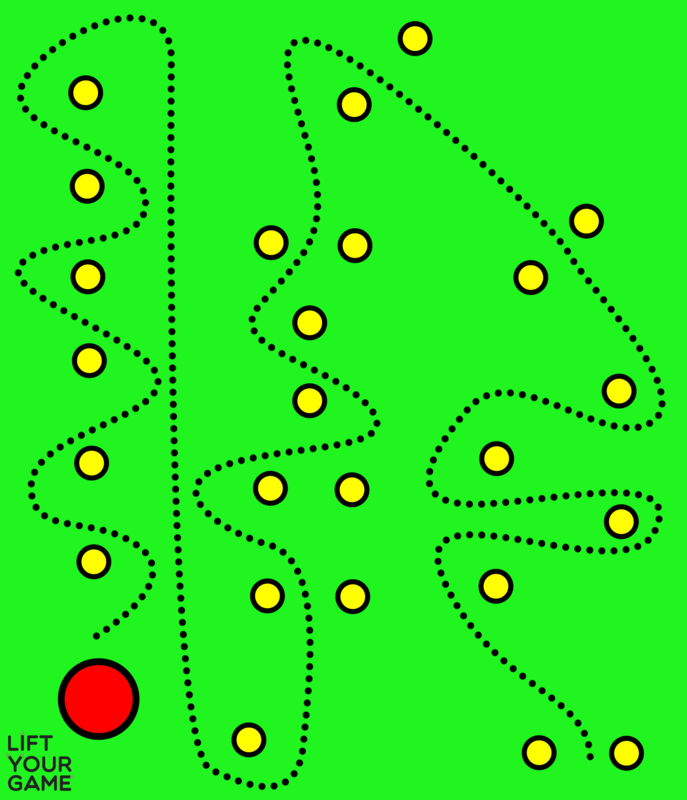 This allows them to take the path of least resistance (the route with lowest possible chance of being tackled) towards goal, for example. It also enables them to choose the perfect time to cut inside, pass, or knock the ball forward – ideally when the defender is off-balance or flat-footed. However, you’ve still got to know where the ball is, otherwise you risk overrunning it, which will make you look like Heskey. It’s all well and good knowing exactly where you’re going and when you’re cutting inside, but you’ve still got to be able to actually execute the move. Each player develops a unique arsenal of skills they can use to beat their defender over the course of their careers. Ronaldinho loved the elastico (at Barca at least) and Ronaldo loved to sprint down the line and chop inside. Messi has a more orthodox dribbling style, with lots of deft touches. Ultimately, it’s up to you to pick your style and hone it with heaps and heaps of practice. With awesome technical ability comes the self-belief that you can take on defenders. You have to have an incredible level of confidence to dribble successfully. Again, this isn’t something that’s super-easy to develop. You need to hone your skills and get some experience performing awesome dribbles in-game in order to develop greater belief in your own abilities. However, one thing that can give you a little more confidence as a dribbler is knowing exactly what you want to achieve. Have you been told to deliver crosses as a winger, or do you want to cut inside and take shots? Or are you looking to improve your ball control in order to develop the play as an attacking midfielder? Obviously you don’t want to cut in/cross every time – this gets predictable. But it’s good to have an idea of what your coach wants you to achieve. You’ve got to keep in mind that you’re playing for a team – sometimes a pass is your best option. There will always be another chance to take on your defender 1v1. Now let’s look at some exercises you can use to hone your ball control. You’ve probably done this drill before, but there’s a way to make it that little bit harder for the dribbler. Rather than just running at your man, have the defender pass the ball up the field to you before you begin running at them. This better-simulates what you’ll be experiencing in-game: having the ball passed to you, and then running with it. You should also keep the field fairly small, to make your job a little more challenging. To “beat” the defender, you’ve got to stop the ball between the two cones – placing your foot on top of it. Simply shooting it through the goal isn’t enough. If you fail to achieve this, the defender wins. Set up a 2v2, 3v3 or 4v4 game, and make the field a size appropriate to the number of people you have. You can’t pass the ball. You’re only allowed to dribble it once you gain possession. To score, you’ve got to stop the ball on the opponent’s goal line – there’s no actual goal. It generally makes more sense to play in a wide (rather than narrow) area to allow for easier scoring. The great thing about this game is it forces you to look up and avoid the swarm of defenders coming to get you. It’s great for training dribblers to get out of tought situations. If you’re finding it a little difficult to score, you can split the field into two/three “zones” and make it essentially a 1v1 or 2v2 in each zone. The ball will transfer over naturally (or you can just swap it when it goes out). This prevents too many defenders ganging up on the dribbler at a time. Looking for something you can do by yourself? Grab a stopwatch and time yourself. See what’s the fastest run you can get, and aim to beat it. For an extra challenge, make a course and race against your team-mates. Restrict how you’re allowed to progress. For example, outside of the left foot only, alternating between your left and right foot, or running backwards. Make the course crazy. Have some really tight gaps, and add super-sharp turns to challenge your agility. If you wanna practice alone but don’t have a heap of cones, you can simply race from one point to another as quick as you can. Time yourself and see how fast you can get from point to point. Running backwards, with the ball in between your legs. Only dragging your foot across the top of the ball. Every touch must be an elastico/roulette/whatever other skill move you’d like to practice. If you fail the skill, you must restart. You can also do the entire distance keeping the ball in the air with keepy-uppies. This is a fantastic way of improving your ball control. Dribbling is all about ball control. Sometimes the best way to get better at beating defenders is to hone your touch. There are a few ways of doing this, but the easiest is to grab a soccer ball (preferably a cheap one) and kick it repeatedly against a wall, trying to keep it off the ground. Use your instep and your laces when kicking the ball, and count how many hits you can achieve without the ball dropping. After enough practice, you’ll notice your ball control and reflexes improve massively, making it much easier to make deft touches when dribbling. Once you’ve got the basics down, it’s time to practice your dribbling in match-style situations. If you’re a winger or wing-back, testing yourself against a defender down the line is a great way of doing this sort of practice. Go to a proper pitch, and put a target near the penalty spot somewhere (like a hula hoop, or a square of cones) and put a single cone two feet away from the far post on the goal line. Now grab a defender (preferably a good one!) and try to beat him or her on the wing, starting off from somewhere before the 18-yard box. Have the defender try to jockey you and then tackle when they spot an opportunity. You get a point when you sink a cross onto the target you’ve laid out in the box, or curl one into the far corner. The defender gets a point when they make a clean tackle – or you can make it so they score when you fail to score, for an extra challenge! Play 20 runs and see who comes out on top. Part of what makes a great dribbler is excellent foot speed and superb coordination. To help improve these specific aspects of your game, you can use an agility ladder. These are basically those flat things you see NFL players use, which are laid out on the ground. You can then move through them in a certain sequence in order to improve your agility. Run sideways on and off the ladder, alternating which foot you’re planting first, as shown. With enough repetitions you’ll soon be able to stop and turn on a dime, which is especially useful for making sharp turns when dribbling. We hope you found these drills were useful! If you know of any other super-secret ways of improving your ball control, let us know in the comments below!